In the late 19th century, Texas was well known for its mineral water resorts. Henry Sigerist, a medical historian, reported that Texas had the second most mineral springs of any state, trailing only Wyoming. Though at this time, Texas was not regarded as having some of the most luxurious spas in America (this spot was held by the older northeastern spa areas) people flocked to Texas by the thousands and were consumed with the mineral springs for one reason­—to benefit from the healthful qualities of the waters. The greatest spa resort growth in Texas was from 1890-1919, during which time over one hundred new watering places were established. It was during this time of mineral water hysteria that the waters of Mineral Wells were discovered and the town formed its identity. In 1877, James Lynch and his wife, Armanda, left the town of Denison, Texas with their nine children and fifty head of livestock. The Lynch’s were searching for a drier climate because their family had been in poor health. Both James (who was fifty years old when the Lynch’s left Denison) and Armanda suffered from rheumatism. They were stopped on their travels by news of Comanche attacks further west, and on Christmas Eve, 1877, one of their oxen collapsed and died after crossing the Brazos River and another was struck by lightning, so they decided to settle down where they were, in a pretty valley tucked in the hills of Palo Pinto County. Mr. Lynch purchase eighty acres of land from the Franco-Texas Land Company for the grand price of $240. From 1877 until the summer of 1880, the Lynch’s hauled water from the Brazos River to their land, some four miles away. That summer Mr. Johnny Adams happened upon the Lynch Ranch. Mr. Adams, a well driller, agreed to drill a well on the property for Mr. Lynch in exchange for a yoke of oxen. At first the Lynch’s were all hesitant to drink the water, because it had a funny taste and they were afraid it might be poisoned. But hauling water four miles is not a terribly entertaining way to spend your day, so they all began sampling the water, and finding that it was not harmful to them, the Lynch’s began drinking the well water. Then a funny thing happened, Mr. and Mrs. Lynch’s rheumatism was cured, and Mr. Lynch, once frail and gaunt, began putting on some weight. In fact, the entire family all perked up and began feeling better. July 21, 1881: Sent the wife and children to the medical well today. There is considerable excitement in the country below the mountains, beyond the river concerning a well that has been dg, the waters of which seem to be benefiting those who drink it. August 16: Left Ed in the office and went to the mineral well to see my wife. There are several hundred people there for the benefit of their health. There is but one well and it does not offer enough water to supply those who are there…Two other wells are being dug. Mr. Lynch’s water proved so popular that he had trouble keeping up with the demand. His well could only produce 100 gallons per day, so in order to get water from the well guests were required to sign a declaration affirming that they were sick and needed the water. Mr. Lynch’s life proved to be a great testimonial to the water’s curative powers, as he lived to be 93, passing away in 1920. Armanda died a year later in 1921 and both are buried side by side in the Elmwood Cemetery in Mineral Wells. A boom was now starting. By the first of October it looked like a small army was camped here. Tents were everywhere. In laying out the town they made the Lynch well the starting point and put it in the center of the block. This block was reserved by Judge Lynch as a public square…The original town was hen laid out covering the 80 acres, then 3 rows of blocks were laid out running east and west on the south part of the Wiggins Addition…Mr. Pritchett came here about October 1 and opened a hotel in a large tent…By November 1st the sound of the hammer was heard in all directions. Carpenters had come by the dozens. The road was lined by wagons hauling lumber from Weatherford and Millsap…Several wells were drilled so near the same time I don’t think anyone remembers which was drilled first. The DeBellet well, the Starr well, the Gibson well and what was known as the white sulphur (sp) well were all mineral wells. The DeBellet well later became known as the French Well, which had the first drinking pavilion. The White Sulphur (sp) well was located where the Baker Hotel currently stands. Two years after the waters healing properties were discovered, 125 wells had been drilled and salve, soap and crystals were being produced. The most famous of the water from Mineral Wells was the Crazy Water. The Crazy Well was originally dug by “Uncle” Billy Wiggins in 1881. 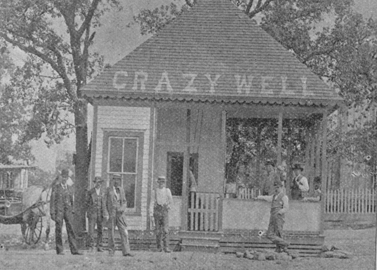 Located at the site of the current Crazy Water Retirement Hotel, the well got its name in an interesting manner. An elderly lady who suffered from a form of dementia would sit by the well all day, asking people passing by to draw her up a pail of water. The water apparently had some positive effects on the “crazy lady’s” illness, and soon others were lining up for the water. The well was originally known as the “Crazy Lady” well, but its name was later shortened to the “Crazy Well.” The Crazy Water Company became the most well known of the water companies, building its original drinking pavilion (a small wooden building built over the well) in the year the well was dug, and its second pavilion (a two-story wooden structure) in 1900. The first Crazy Hotel was built in 1912, and enlarged in 1914. It burned in a fire in 1925, and was reconstructed in 1927. There were four different consistencies of Crazy Water, labeled Number 1 (the mildest strength of the Crazy Water) through Number 4 (the strongest of the Crazy Waters), and each water was recommended by the Crazy Hotel’s doctors for different ailments. So what was in the water that attracted so many to this infant town? There is a significant amount of lithium found in some of the town’s wells, indicating that the Crazy Water story may weave a few facts into the folklore. The early promoters credited the water’s medicinal agents­­—primarily calcium, magnesium, and sulfate­—with the power to relieve or cure, dyspepsia, neuralgia, sore eyes, paralysis, insomnia, liver and kidney problems, rheumatism, scrofula, and improprieties of the blood. People came from near and far because they all believed in the water’s healing qualities. Texas does not realize what she has in [Mineral Wells], and it is not advertised half enough. Every time I go there, I come away with a greater belief in its possibilities. It is Nature’s resting place, and health resort for Texas and the entire world. It is destined to be one of the greatest watering places in America. In 1909 there were: 4 bath houses (The Bimini, Lamar, Bethesda and Anna Bell); 7 wells and pavilions (The Crazy, Gibson, Texas Carlsbad, Lamar, New Beach, Starr and French Iron); 2 sanitariums (Mineral Wells Sanitarium and Rountree); and 46 hotels and boarding houses. The early hotels included the Wann House, the Beeler, Richards, Cliff, Leiper and Piedmont. The later era hotels included the Hexagon, Fairfield Inn, Oxford, Colonial and Period. Tracing the hotels through the years is difficult due to frequent name changes, changes in ownership and due to several fires, including the July 4, 1914 fire, which swept across the city and destroyed many of the older buildings. By 1913 there were 21 mineral water companies in town. In 1904, Ed Dismuke and Cicero Smith built a lake for visitors (Pinto Lake) and organized the Mineral Wells Lakewood Motor Car Scenic Railway (thankfully shortened in nickname form to the “Scenic Railway”). The Scenic Railway ran from Northwest 6th Street (the current site of the Famous Mineral Water Company) to Pinto Lake every fifteen minutes and cost fifteen cents per ride. The Scenic Railway trains were actually “dinky cars” which are small gasoline powered vehicles that ran on railroad tracks. Trolley car lines were laid in Mineral Wells 1905. There were four trolley cars carrying thirty people each. The trolley cars took visitors from the city center to Elmhurst Park, located south of Mineral Wells, which was a 100 acre park with a lake, bandstand, dancing pavilions, cafes, a merry go-round and casino—which had seating for 1,500 people. The Vichy Well (later known as the Beach and then the Standard Well and Amusement Park) was the size of an entire city block and included a movie house, playground, dancing pavilion, swimming pavilion and flower garden (The Vichy Well was located where the current North Oak Community Center is found on North Oak). The Sangaura Sprudel Well had a bowling alley and billiard rooms, and the French Well had a dancing hall and a skating rink. The water pavilions changed too, as physicians relocated their offices to the bath houses, and their offices grew into clinics, which grew into sanitariums. The wells were transformed into spas with mineral baths, lodging and massages. The Crazy Hotel was built by Dallas businessman, Carr P. Collins (the original hotel burned in 1925 and Mr. Collins rebuilt the hotel, which reopened in 1927) had 200 guest rooms, a dining room, shops, barbershop, doctor’s office, florist, bookstore, recreation department, drinking pavilion and bathhouse. In the pavilion of the Crazy Hotel, two to four employees were kept busy every day, from early morning until ten o’clock at night, drawing water from free-flowing faucets to parcel out to customers waiting in line, sometimes four people deep. The seven-story Crazy Hotel also had a roof –top garden and a vast lobby where hotel orchestras and bands would play in nationally broadcast shows. A group of Mineral Wells businessmen resented the fact that a Dallas man was taking control of the Mineral Wells hotel industry. They conceived an idea to build a hotel aimed at outclassing the Crazy Hotel. The group turned to famed Texas hotelier, T.B. Baker, with their plans for a grand hotel, Mr. Baker apparently liked the idea. The Baker Hotel, which opened on November 22, 1929, was fourteen stories tall and, to the satisfaction of the local businessmen who dreamt up the hotel, it dwarfed the Crazy Hotel in size. Built to be exactly two times the size of the Crazy Hotel, the Baker had 450 guest rooms and featured tennis courts, medical clinics, an entire floor dedicated to mineral baths and massages, shopping, a beauty solon, drinking pavilion, outdoor pool, and was the home of the famous Brazos Club. The Baker Hotel was built for $1.2 Million, and was modeled after the Spanish Renaissance style of the Arlington Resort Hotel and Spa in Hot Springs, Arkansas. Where Mineral Wells had been known as a health retreat, the Baker Hotel became known as the place “where cattle kings and oil tycoons twirled society gals to the sounds of Laurence Welk, Paul Whiteman and other big bands.” The town’s social life revolved around the Baker following its opening, being at the Baker meant you were a part of the “in-crowd” in Mineral Wells. In an effort not to lose all its business to the new glamorous Baker, the Crazy Water Company constructed a large metal sign across Highway 281. “Welcome to Mineral Wells” the sign read, “the home of Crazy.” Both hotels pulled in their fair share of celebrities, as they hosted such luminaries as Will Rogers, Tom Mix, Lyndon Johnson, Jean Harlow, Sam Goldwyn, Clark Gable, Helen Keller, Roy Rogers, Ronald Reagan, the Three Stooges, Minnie Pearl, Judy Garland, and many more. The trains that brought visitors to Mineral Wells also gave mineral water companies the ability to distribute their waters and products made from the minerals of the waters. Due to the weight of water, costs of shipping were relatively expensive, so the entrepreneurs developed innovative ways to ship the minerals without the weight of the water. Water companies began condensing the water into crystals. The water was boiled until nothing but the minerals were left, and then it was packaged and shipped around the world. One box of the crystals contained minerals from approximately 40 gallons of water, and once the box of crystals was purchased, the lucky buyer could add the crystals to their own water and instantly have a cup of Mineral Wells mineral water. In 1884, the Gibson Company marketed crystals, condensed mineral water, salve, oils and soaps. It proved so popular that by 1893 twelve other companies were marketing their waters and related products as well. By 1913 there were 21 mineral water companies in Mineral Wells. With the dawn of the 1930’s, the mineral water craze began to fade. During the Great Depression the Crazy Water Company concentrated its energies into promoting the Crazy Water Crystals. The Crystals were found in drug stores all over the country. With a teaspoon of the Crazy Crystals and a glass of tap water, people could enjoy the healthful benefits of the Crazy Water at their own home. Fewer and fewer people had the money spend the season in Mineral Wells, and visits changed from a few months to a few weeks and finally to a few days. Adding to the troubles, the Food and Drug Administration began to control medical advertising, limiting the claims crystal manufacturers could make. Discoveries in the medical field of penicillin and other antibiotics plus other medical advances changed the face of the medical industry, putting less emphasis on mineral waters and other natural healing methods. By the 1940’s most of the water companies had closed down, no longer enough visitors to keep their doors open. During World War II, gas was rationed and people could no longer make the journey out to Mineral Wells. The economy of Mineral Wells, long dependant on the mineral waters, changed to become more reliant on the military base (originally Camp Wolters and later changed to Fort Wolters), which opened on March 22, 1941. Soldiers and their families filled up the hotels which were filled by health seekers before. The waters were promoted less and less, and Mineral Wells no longer depended on its water tourism industry. The Baker Hotel eked out an existence based upon travelers coming to town because of Fort Wolters. Earl Baker, the nephew of T.B. Baker took over ownership of the hotel in the 1950’s. Jet travel soon made more distant resorts more accessible, and made nearby high-class hotels like the Baker less attractive destinations. Earl Baker saw the writing on the wall and sought a purchaser of the hotel, proclaiming he would shut down the hotel if he found no buyer before his 70th birthday. Finding no one interested in the hotel, Mr. Baker shut the Baker’s doors on May 31, 1963. But a group of local businessmen purchased the Baker for $375,000 in 1965, and the hotel reopened in June 1965. The new owners did not find success, however, as Fort Wolters was set to close, thereby eliminating the only visitor base left, and the hotel was closed for good in March of 1972. The Crazy Hotel could not survive either, and became a retirement home. The Famous Mineral Water Company is the only remaining reminder of this long-past era where visitors flocked to Mineral Wells to sample the mineral waters. At the Famous you can still sit at the bar, order a mineral water, and enjoy the taste that made this town such a resort a century ago. The history of the Famous began in the early 1900’s when Ed Dismuke, a druggist from Waco, Texas, was given a death sentence from his doctors at the age of forty. Mr. Dismuke was advised that there was no remedy for his ailing stomach and was told to prepare himself for his journey beyond his life. Being a state-of-the-art apothecary, he refused to believe this and began a search for a cure. Ed Dismuke did not have to go far. He headed northwest about 100 miles to an acclaimed health resort town tucked away in the beautiful Palo Pinto Mountains. In the town of Mineral Wells, the pharmacist went on a drinking binge of mineral water and his ailments soon disappeared. As a believer and beneficiary of the mineral water’s curative powers, Mr. Dismuke quickly sold his 25 year old pharmacy in Waco and moved to Mineral Wells. It was in 1904 that Ed Dismuke founded the Famous Mineral Water Company, and established himself as one of the town’s premier purveyors of the health-giving elixir. The current Famous Pavilion was built in 1914, complete with a game parlor and a fortune telling booth. Drawing on his experience as a pharmacist, Mr. Dismuke developed products from the curative waters. Pronto-lax, Residuum, Dismuke’s Famous Crystals and Dismuke’s Eyebath were all sold nationally and were each an outstanding success. Nearly 6 decades after his arrival in Mineral Wells, Mr. Dismuke noted that his Waco doctors had been dead for a long time. “The only thing wrong with me is old age”, he told reporters after his 97th birthday. Claiming he was never again treated by doctors after beginning his daily regimen of Famous Mineral Water and Proto-Lax, Dismuke devotedly promoted the mineral waters’ health giving properties. Mr. Dismuke died November 6, 1957 at the age of 97 after falling and breaking his hip. He is buried in Elmwood cemetery in Mineral Wells. Howard Nevils managed the pavilion operations for Mr. Dismuke for more than two decades. His son, Donald told tales of the locals coming into the pavilion and playing many games of dominoes some of which got pretty rowdy! He remembered the days when the water sold for 3¢ a glass and 20¢ a gallon. Customers would give testimony to how the water would make them feel better and fight away illness. Donald said he “would drink 8 to 12 glasses a day of the mineral water and thinks that the good health he’s had can be contributed to the waters”. Mr. Dismuke’s widow, Mrs. Ida Mae Dismuke, sold the Famous Mineral Water Co. to J.C. Causey in 1958. Afterwards, the Famous Water Company went through a series of owners until in August of 1985, when the pavilion was donated to the Palo Pinto Historical Foundation. In 1988, H.F. and Charles Hickey extensively restored and renovated the Famous Mineral Water Pavilion. The Hickey family successfully operated the company for approximately five years under lease from the Foundation. On April 15, 1994, the Famous Mineral Water Company was leased from the Palo Pinto Historical Foundation by Sherry Holland. The Historical Foundation sold the Property to the present owners, Bill and Helen Arneson and Carol and Scott Elder on October 1, 1999, who have been operating the Famous Mineral Water Company at the pavilion ever since the purchase. Mineral Wells was truly built on its waters, and the mineral waters provided the town with its identity for the first sixty years of its existence. Though the water’s popularity diminished in the 1950’s, the famous water of Mineral Wells has had somewhat of a resurgence of late, and perhaps we can all envision a time when tourists from near and far will flock to Mineral Wells to “take the waters” and enjoy the fair city once again.